FairlawnGig’s fast Internet is primed for action with all the streaming services, which feature packages of channels like cable TV, but deliver TV content over the Internet. In the year since Sony introduced their PlayStation Vue streaming subscription service, we’ve witnessed an upending of the cable TV and satellite TV market as even more streaming services are introduced. When you’re cutting the cord and streaming your TV content, you have access to a wide variety of great new TV content. Many people also want to keep those familiar cable channels, and they want other cable features such as DVR (Digital Video Recording). PlayStation Vue streaming service offers both—four different channel packages and a cloud based DVR service. The DVR capabilities of Playstation Vue are more advanced than Sling TV or DirecTV Now at this point. However, all three services are new and they are improving their offerings over time. 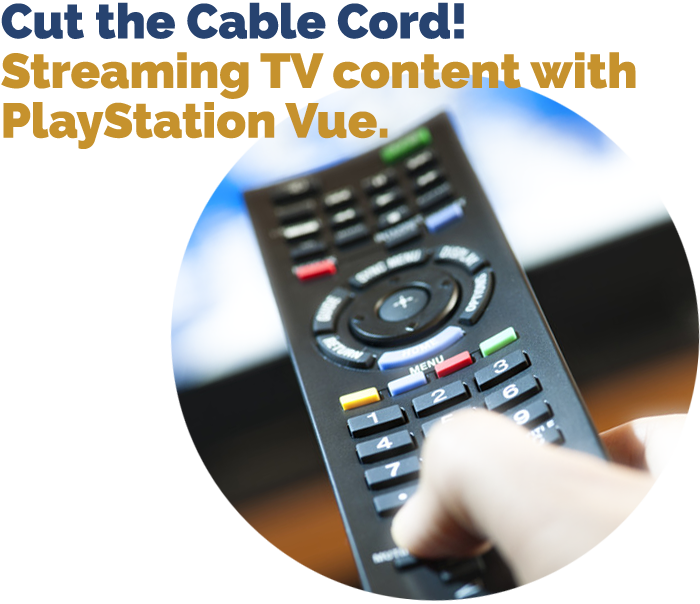 Playstation Vue works with Playstation (PS3 and PS4) but it also supports other streaming devices such as Roku, Apple TV, Amazon Fire TV, Google Chromecast and more. PlayStation Vue is versatile: working with both Apple and Android devices, many streaming boxes and eventually, all browsers. It supports simultaneous viewing on up to five devices in your home. However, your Vue account is tied to a single address, so you can’t bring your console to a friend’s house. However, you can use apps on your mobile devices when away from home and log in with your PlayStation Vue credentials. But note that your devices will be tied to your physical address, so you can’t use someone else’s mobile device to log in. PS3 and PS4 consoles are each limited to one device streaming at a time, but with other streaming devices, you can watch up to five streams at once. The cloud DVR works similar to a physical DVR. Like all the streaming services, Sony has added new add-on channels to its lineup which include HBO, Cinemax, NFL Network, and NFL RedZone. How well all streaming services work depends on your Internet service. The speed you’ll get with FairlawnGig’s fiber and the ONT will allow for lightning fast downloads and buffer-free, uninterrupted viewing. We recommend FairlawnGig’s Premium plan (100 Mbps down, 100 Mbps up) or above for optimal performance: fast download speeds, multiple streams at the same time, and the highest resolution available. A Fairlawn resident who has PlayStation Vue said he prefers streaming with Amazon Fire TV over the Amazon Stick, which has less processing power. He also liked Vue’s 60 frames per second on Fire TV (30 on the Fire Stick), Roku and Apple TV. On Sling TV, it’s 30 frames per second on all devices. This is noticeable and annoying during faster motions like sports or action scenes. The faster frame rate is another advantage of Vue. There are four plans, ranging from $29.99 to $64.99 per month. Some of their add-ons are pricier than other streaming services. Monthly, add-ons included HBO is $15, Showtime from $8.99 to $10.99; Cinemax is $15; additional channels are available. Check their website for current plans and add-on channels. Like all streaming services, PlayStation Vue periodically adjusts prices and adds to and tweaks its channels offerings. The DVR is in the cloud, which means you don’t need a DVR box; your programs are stored online. You can record an unlimited amount of live TV and store it for 28 days. PlayStation Vue automatically stores up to three days of the most popular primetime shows on select channels. Everything but the TV guide is arranged on a grid, where you’ll find live TV menus, content recommendations, your favorite shows and a traditional TV guide. Searching for programs is easy: by show name, category, genres and more. Our Fairlawn resident liked Sling TV’s interface a bit more. The NFL Network is included in the “Core” plan and Core subscribers can add the full season of Redzone for $40. But Thursday Night Football games are blacked out on NFL Network when those games are aired on NBC or CBS. Our Fairlawn resident pointed out that in Summit County, the main live Fox channel is not available on PlayStation Vue, but you can watch on-demand for Fox shows. He noted that you can download the Fox Sports Go app to watch sports, but he found that it had performance issues sometimes and can stutter. Fox recently put out a fix so it has been better lately. If the Indians are on Fox, you need to switch to the Fox Sports Go app in order to watch. We have heard from another Fairlawn resident who was able to get Fox Sports Ohio with the Core Slim package. Fairlawn residents will find costs are less than what they are in larger cities. More expensive than some other streaming services like Sling TV. Visit PlayStation Vue’s website for the details. You can read about Sling TV and DirecTV Now on our website’s Cutting the Cord page, as well as using antennas to get local channels. All three services we’ve featured have free trials and set-up is a breeze. Try them all out to compare. Or if you sign up for one service and want to switch, there are no long term contracts or cancellation fees. FairlawnGig does not endorse any particular streaming service; this overview is intended to help you make a decision about which service would work best for your household. FairlawnGig service is great for streaming TV content, which is the future of TV. Please sign up for service here.